When she was 3 years old, Karla Puno Garcia first stepped on a stage to dance. Enrolled by her parents in a beginner tap dance class in San Francisco, CA, the three-year-old seemed to have a natural talent for movement. Unfortunately, her first performance didn’t go as planned. Now, Garcia is a swing in the 11-time Tony-winning show, “Hamilton” dancing in several shows a week. The 31-year-old from Oxon Hill, MD now has the honor of being the first Filipina cast in the show. Dancing and theater have always been a part of her life, but one day when she was 8 her dad said, “Hey you should watch this, I think you would enjoy it.” It was the Tony Awards. 22 years later, she would be on the Tony Awards stage for the first time. That same year, she got her first taste of the Broadway stage when her family went to see “Crazy For You” and one cast member in particular captured her attention. Garcia continued to dance at a dance studio in Oxon Hill, MD, where she says they were groomed to be on Broadway. Dancing on Broadway became a real possibility when she was 12 years old and got to see her 16-year-old God-sister, Lamae Caparas, perform at the Kennedy Center in the national tour of “The King and I”. Throughout high school, she continued to dance and determined to be on Broadway, just like her God-sister. 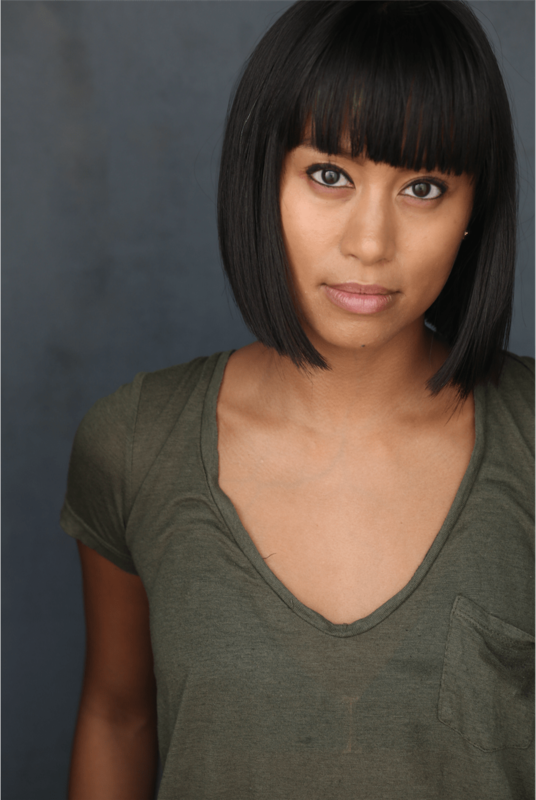 After graduating from Bishop Ireton High School in Alexandria, VA, Garcia went on to NYU Tisch where she earned her BFA in dance, and a minor in journalism. In the fall of 2006, she went to an open casting call for a new dance musical. It was her senior year at NYU Tisch. The choreographer, Maurice Hines, thought she did as well because he complimented her during the audition. Callbacks were in two days, but the days passed, and she never got a phone call. By the time the two days were over, she had accepted the fact that she wasn’t quite right for the show. After accepting the rejection, she decided to check an email that she usually doesn’t, and the casting agency had emailed telling her that they couldn’t get ahold of her via phone. The cellphone number on her résumé was one digit off. She frantically called them back, they told her that Hines loved her audition, and wanted her to be in the show. No callback required. And just like that, Garcia had booked her first Broadway show, “Hot Feet”. Rehearsals were set to begin in February and she still had a semester left of school. So Garcia decided to take her last semester off to make her Broadway debut. “I just didn’t know it would happen to me!” she exclaims with a tone of surprise, of getting cast in a show before her graduation. Rehearsals went on all through spring, and “Hot Feet” had its out of town opening at the Kennedy Center in April 2006, and moved to New York in May. On July 23 of that year, the show closed after 12 previews and 97 performances. Looking back on “Hot Feet” Garcia says it was a good experience that her first Broadway show was such a flop. She gained her Broadway equity card, and when the show closed, she knew that had had school to go back to. Once she finished at NYU in fall of 2006, Garcia immediately started auditing for shows, and was having a difficult time. She started teaching in the tristate area, which is something a lot of performers do between shows. “But I still had a lot to learn!” she exclaims. Finally, in the fall of 2007, she booked her first show since “Hot Feet”. The Radio City Christmas Show in Fort Lauderdale, Florida. During their time in the show, Karla and her roommate decided to fly up to New York for the “Wicked” national tour auditions. After the audition, they flew back to Florida, and the next morning, her agents called with good news – telling her that she had booked the “Wicked” national tour, in January of 2008. The tour was a great experience, but she still felt like something was missing, and ended up leaving the tour after seven months. When Garcia left the show, she didn’t have another gig planned, which is considered a major gamble in the theater industry. “I hadn’t had my completely fulfilling Broadway experience yet, you know? Cause I had that flop,” she explains with a knowing smile. In February of 2009, Garcia gained some fame on season 5 of the hit show “So You Think You Can Dance.” She was eliminated in week 4, and made connections that would help her throughout her career. After her stint on the show, booked The Radio City Christmas Show, this time in New York City. After her dancing her way through the Christmas Show, Garcia began to tour the globe with a ballet dancer group called Bad Boys of Dance, but once again, she decided to leave after a few months. She decided that a change of pace was necessary. So she packed her bags, and decided to move to L.A. to “start over” at 25 years old. “I did not like it,” she says bluntly. Then she got a phone call from a production of “West Side Story” back in New York City, and they were asking her to come back to cover a part of an ensemble member who was on vacation. After the show closed in January 2011, Garcia started to get back into choreography and building her voice. Only a few months later, she booked her next show, the national tour of “The Addams Family”. Another TV opportunity came up when Garcia was on tour with “The Addams Family.” The hit show SMASH was gaining popularity when the cast was on the road and they would watch it in their free time. When she came back from “The Addams Family” and was eager to get in the audition room for “SMASH”, but her former agents said that although they had really tried to get her in the room for the audition, they were unsuccessful. Garcia took matters into her own hands. She knew the associate choreographer, Ryan Kasprzak, from her time on “So You Think You Can Dance” and she texted him because she had heard there was a callback for the show. Kasprzak immediately agreed that she would be a perfect fit for the show, and soon after, Garcia’s agents called with the news that she was going to be able to audition for “SMASH”. She got herself in the room for the audition, and was on “SMASH” in 2013 for 9 episodes as a dancer. At this point, Garcia was teaching and continuing to work on choreography and building her choreographic voice. In 2015, Garcia booked “Gigi” on Broadway, which led her to the Tony’s stage for the first time. On June 7, 2015, Garcia got to perform on the 69th annual Tony Awards, the same show that he father showed her 22 years before, this time, dancing with the company of “Gigi”. Her God-sister Lamae Caparas was also performing on the Tony’s, in the company of “The King and I”. Just 2 months after the 69th Tony Awards, there was a casting call for “Hamilton” and they were looking for a female swing. The show had just opened on Broadway in the Richard Rogers Theater. In musical theater, a swing is an ensemble member who plays one or more roles in the show. These roles are often referred to as “tracks”. In “Hamilton” there are 5 female tracks, and if she got cast in the show, Garcia would learn all of them, and be ready to perform them at any time. There were 5 women in the audition room, and Garcia kept asking herself “How am I here?” The casting agency that was casting “Hamilton” had also cast “Wicked” and “The Addams Family”, so she was definitely in their books. Garcia still doesn’t quite know how she got into the audition room for “Hamilton” because it was such a small number of dancers who were asked to that audition. “I am so grateful for getting into that room,” she says, her excitement visible. After putting them through their paces, the casting directors announced that the 5 girls in the room were on the short-list for “Hamilton” and that they would all be in the show at one point or another. “And you know when you hear that, and you wanna believe that, but you never really know,” she says. Now she was on their short-list, but she wasn’t hired for the show at that point. Her friend, Kamille Upshaw, was chosen to be in the show. In the next few months, Garcia saw the show twice, always admiring how great it was, but never thinking that she would be in it. The opportunity was here, but she had already booked another gig as Consuela in “West Side Story” at Carnegie Hall. Garcia wanted to know how many dancers had been called in for the audition. When she got to the audition, they wanted to hear her sing for the music director, Alex Lacamoire. He taught her some harmonies from “The Room Where It Happens” and had her sing the end of “Yorktown (The World Turned Upside Down)” to see how high she could belt. Finally, Lacamoire said, “Well why don’t you wait outside and I’ll talk to Beth, and we’ll see if Beth still needs to talk to you.” Beth was the casting agent. It was at this point, Garcia started to tear up. “It was that same feeling I had when something phenomenally new and exciting has happened,” she says with a huge smile coming across her face. Although it is just another gig and another job, something about this show is special to Garcia. “He literally just threw that sentence away like it was casual,” she explains. “But from then on, it’s like everyone would say ‘The first Filipina cast member!’ And I’m so grateful for him to recognize that,” she says, her eyes bright with pride. Now, it’s been almost 11 years since she first started on Broadway, and the journey has come full circle. She started in a show that turned out to be a flop, and now she’s dancing in the show with the hottest ticket on Broadway. Throughout her career, she’s been building her choreographic voice, and after she takes her final bow on the stage, her choreography will take center stage. Cover photo and professional photos credit to TED ELY.